There are some butterflies that I always photograph, when I meet them. 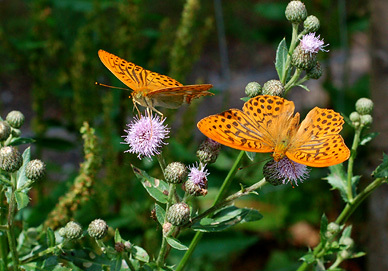 The Silverwashed Fritillary and the Comma are two of them. Maybe its because both species keep changing their colours in the light and always look so different. Newly hatched Silverwashed Fritillaries glow in brilliant orange colours and are unbelievably beautiful when they cross a sunny slope with a dark conifer forest in the background. The Silverwashed Fritillary to the left is captured with a 300 mm tele, Aperture 7 and shutter 1/1200. ISO settings were 400, and that was too much. I forgot to set it back after having photographed Poplar Admirals in the shadows of the forest. 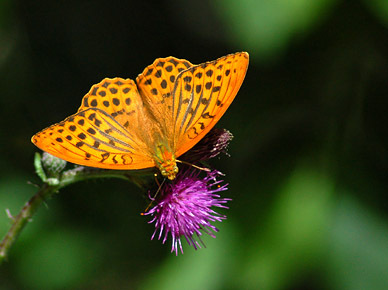 The Silverwashed Fritillary is easy to photograph for several reasons: It flies in the midday sun, and it flies in fair camera hight. When resting it often opens its vings in a perfect 180 degree plane, so its possible to place DOF so that everything is kept in focus. Blues and hairstreaks won´t do so. Being relatively common and widespread and often very numerous at forest roads or clearings with thistles makes the Silverwashed an easy prey for the Photographer. When it is sucking nectar it is not very shy, and you can get very close with the lens. Really close, so that the lens touches the butterfly. 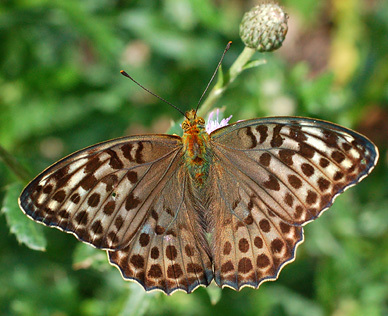 It is a special experience to stand among hundreds of Silverwashed Fritillaries hanging from, or flapping between headhigh thistles in a forrest clearing. 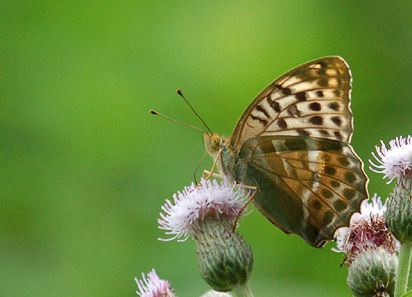 The Silverwashed Fritillary to the right has not been cropped. I was close. I think the 50 mm makro lens touched it. 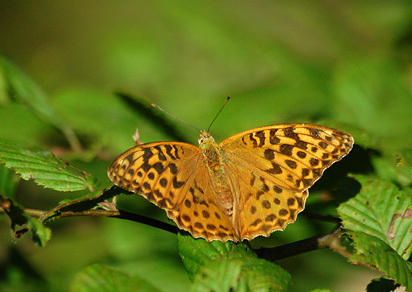 The Silverwashed Fritillary is widespred in forests in Sjælland and the southern islands. It has become rare in Jylland for unknown reasons. Being found many places does not mean it is always numerous. Often you only see one or a few, while you in some place can count them in hundreds or even thousands. Roden skov, Mellemskoven, Hannenov and the forests around Maribo are such "Silverwashed woods"
Anyhow, the best place to photograph the Silverwashed Fritillary is at Høvblegen, Møn, though it is not very numerous there. The hills are facing southwards to the sea and you get a couple of A stops donated by the incoming reflected light from the sea. Futhermore the soil is calchine and many places the white chalk ground can be seen between the thin vegetation cover and reflections from the white spots softens up shadows from the sun. Extra light is always appreaciated by the Photograph. 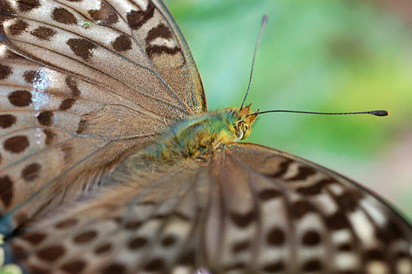 Male, Female, Upperside, Underside and "Splendour". It can be interesting to photograph butterflies with bites from birds beaks or tears from thistles. They tell stories of accidents and lifestyles. But for the collection of butterfly portraits, you are better off by photographing newly hatched specimens. Their colours are brighter and the contrasts are clearer. That makes them better for identification purposes, which is much of the intent of the portrait photo. Newly hatched Male, Holmegård July 2006. Torn and wornout Male, Høvblegen August 2006. Mmany butterflies are easier to photograph from the underside than the upperside. 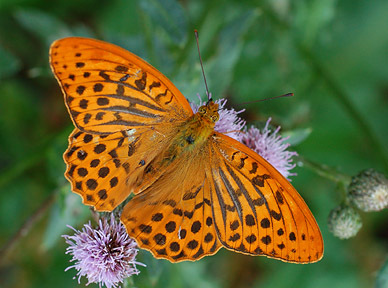 Its the opposite with The Silverwashed Fritillary. it often rests with its wings wide open. An exception makes bad or overcast weather. Then it settles in the trees, often out of reach of the telephoto lens and hard to spot by the eye. Of course you can lay down on your back under a thistle and take the underside against the blue sky, or you can click series from the side when it flaps the wings. The underside of the valesina to the right, is from such a series. The picture is taken against the light and does not show the features of the underside well enough to be a proper "Underside Portrait"
Kejserkåbe hun f valesina, Holmegård Juli 2006. Female forma valesina, Holmegård July 2006. Female normal form , Alsace France July 2006. 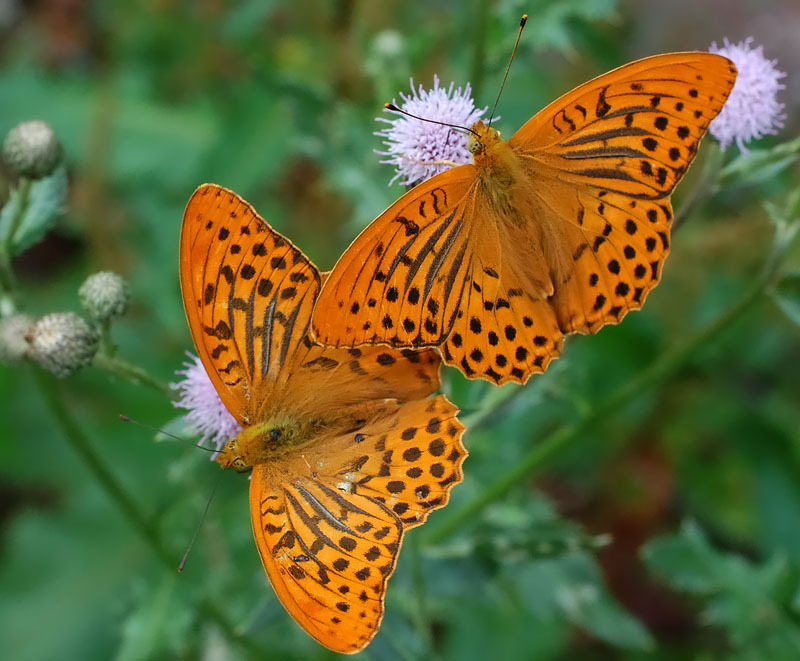 Now we can tell a story: Once upon a time there were two Silverwashed Fritillaries, they were brothers: "Do you dare this?" asked the first brother: "Take care, you will crash to the ground!" the second brother replied. If you can project your anticipations into the photo it talks to you and probably also to other people. Now, all the thistles on this photo complicates the composition and distracts the viewer. Perhaps we could make the photo more interesting by stepping closer? This looks good, doesnt it? But they do not sit well, and the composition is confused as the heads of the butterflies lead the eye out of the photo in either side. But now I know what to capture next time, I meet them: Two or more Silverwashed Fritillaries with their heads pointing towards the camera or towards the same point in the composition. I would also like the background darker and with some blue colours.